How many meals should you eat per day for maximum muscle growth? The traditional bro wisdom was to eat every ~3 hours to fuel non-stop anabolism. About a decade ago some bodybuilders still had protein shakes next to their bed to slam down in the middle of the midnight in case they woke up. Some even set their alarm. 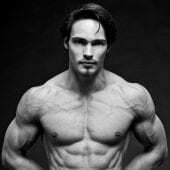 With the rise of intermittent fasting (IF) and if-it-fits-your-macros (IIFYM), the old bro wisdom was relabeled as bro science and many people started eating fewer meals a day. 4 Meals a day with a 16 hour waking time means you need to consume a meal every 4 hours. It’s not quite the 3-hour rule from the bro era, but it’s not far off. In other words, bad news for all IF and IIFYM proponents and everyone only eating breakfast, lunch and dinner without a 4th meal and as a result, my inbox is flooded with worried fasters. Here are my thoughts on the topic. Why would we need to eat at least 4 meals a day? The rationale for the minimum meal frequency of 4 crucially rests on the body’s limited capacity to increase muscle protein synthesis after a single meal, a phenomenon know as the muscle-full effect. This anabolic ceiling seems to be quite low: it takes just 20 grams of protein in many studies before the body says “That’s enough protein right there, bro!” and uses all further amino acids for energy production rather than protein synthesis. With an anabolic ceiling of about 0.4 g protein per kg bodyweight (0.18 g/lb) and the knowledge that you need 1.6 g/kg protein per day for maximum muscle growth, the authors conclude you need to divide your protein intake over at least 1.6 / 0.4 = 4 meals a day to get maximum muscle protein synthesis and growth. There are potential 2 holes in this theory, which the authors readily acknowledge. Firstly, fortunately, we can increase this ceiling of ~20 grams or 0.3 g/kg bodyweight and delay the muscle-full effect with strength training. After a workout, the body is stimulated to increase muscle protein synthesis to build new muscle tissue and accordingly, the dose-response effect of protein now rises to about 40 grams. Research finds that the anabolic ceiling seems to be higher after a full-body workout than after a workout where only a single muscle group is trained, so it stands to reason that the more muscle growth your workout stimulates, the more protein the body will use for muscle protein synthesis afterwards to actually build that new muscle tissue. I also personally recommend far higher protein intakes than just 20 grams in the first meal after a workout. Secondly, a crucial limitation of most of the current research is that’s it’s largely based on protein supplements, in particular whey protein. Since whey protein has a very good amino acid profile, is very rapidly absorbed and isn’t the best at reducing protein breakdown, only stimulating protein synthesis, the body may be able to use more protein per meal for muscle growth in practical settings where you consume a whole mixed meal with dietary fiber, carbs, fats and an unprocessed protein source. Indeed, the authors note that one paper found 70 grams of beef protein stimulate more net protein balance than 40 grams, mainly because of a greater suppression of protein breakdown (also found in this study). Protein breakdown can only be suppressed a little compared to the major variation you can achieve in protein synthesis, as the body tends to only break down proteins that actually need to be replaced, but if we’re talking about optimizing muscle growth, every little bit counts. Diminishing returns are also found for total daily protein intake, so it makes sense that they exist on a per-meal basis as well. I would add a third counter-argument to the theory you need 4 meals a day: Prior fasting potentiates the cellular anabolic response to a meal. This increased anabolic signalling by the muscle cells should lead to increased muscle protein synthesis (MPS), meaning the anabolic ceiling is higher after a fast than after you’ve consumed a meal just shortly before. You consume mixed meals of largely whole foods, not just whey protein powder. You roughly synchronize your protein intake with the body’s capacity to increase MPS, i.e. you consume more protein post-workout, pre-bed and after long fasts. It’s very plausible that this way your body can utilize, for example, 0.6 g/kg protein post-workout and 0.5 g/kg protein in 2 other meals, amounting to 1.6 g/kg effective protein usage with just 3 meals a day. Let’s see what the research says about how many meals you need to eat to get thick, tight and juicy. Brad & Alan carefully note that long-term research findings do not consistently support their theory. They cite 2 studies showing it may actually be beneficial for sedentary individuals to consume the majority of their protein in a single meal of the day for the purpose of muscle retention during a cut. Indeed, many studies show no detrimental effects of meal frequencies as low as a single meal. See the table below for an excerpt of the literature overview of our online PT Course module on meal frequency. The literature on intermittent fasting also doesn’t show any detrimental effects of lower meal frequencies, as Alan & Brad acknowledge. This includes 2 studies in which the participants performed strength training. While the studies weren’t tightly controlled, they at least do not support the theory that intermittent fasting causes you to significantly miss out on any gains. Thirdly, I’d add that if higher meal frequencies increase muscle protein synthesis, they should also increase energy expenditure, since protein synthesis is an energy intensive process. However, an abundance of research shows that your meal frequency does not affect your energy expenditure, all else equal. In contrast to the 3 lines of research above that do not support the idea you need to eat at least 4 meals a day for maximum muscle growth or retention, there is only a single citation to support the idea. Arciero et al. (2013) found that consuming 6 meals a day instead of 3 led to a greater increase in lean body mass at energy maintenance and less lean body mass loss in energy deficit. This study also found a higher thermic effect of food with 6 vs. 3 meals a day, in contrast to many other studies. Now, this outlying study was sponsored by Abbott Laboratories and the participants basically lived on the study sponsor’s products. Assuming the results are in fact legit in the first place, the highly processed nature of the foods may have necessitated the higher meal frequency in this case. The 3 extra meals in the 6-meal group were protein supplements and the other 3 meals consisted of i.a. “no-sugar-added applesauce and other American Heart Association approved cereals and granola bars”. The 6-meal group also consumed an extra serving of protein pre-bed, so it may have been the different distribution of the protein intake rather than the meal frequency per se that made the difference in this study. Because of the inconsistent results in the literature, the authors conclude it’s reasonable to go by theory as there is no research specifically on muscle growth in strength trainees in positive energy balance. All the research showing your meal frequency per se doesn’t matter is either in sedentary or cutting individuals in energy deficit. This is only true if we only consider published papers though. 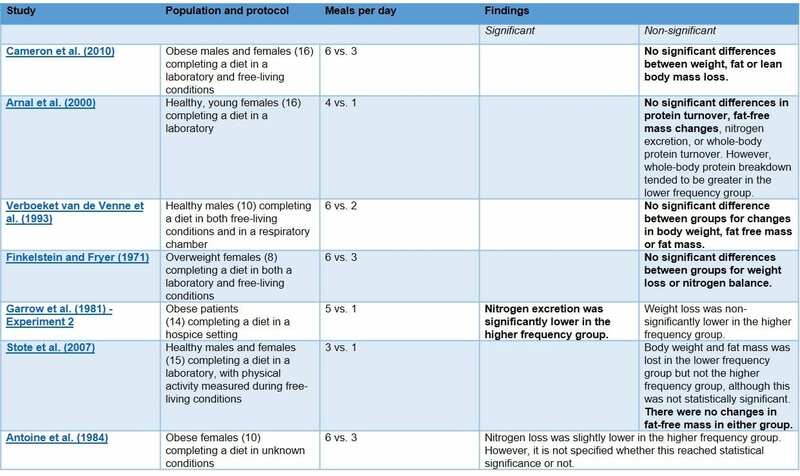 While it hasn’t been published in a scientific journal, we do have the Norwegian Meal Frequency Project, a study comparing 2 groups of bulking strength trainees consuming either 3 or 6 meals a day with the same macros. No, not the Norwegian Frequency Project and yes, apparently the Norwegians have a habit of conducting extremely relevant studies in strength trainees and not publishing their results, but in this case there is a semi-good reason for that. This study was Øyvind Hansen’s master thesis. Master theses often don’t get published, because there is this asinine idea that they’re ‘not good enough for real science’ and many students simply don’t have the reputation or confidence to submit their work to a scientific journal and pass peer-review. In any case, while the study hasn’t been published, it has been reviewed by the professors at Oslo university and we can scrutinize all 105 pages of its full text here. Its design is close to ideal. 16 men and 11 women with strength training experience followed an identical strength training program and consumed real-life ‘healthy’ diets with no significant difference in macronutrient intakes for 12 weeks, with the only difference between the groups being that they consumed either 3 or 6 meals a day. The superiority of the 3-meal group puzzled the authors. It’s hard to understand how eating fewer meals a day could benefit muscle growth. It’s possible the 3-meal group had a higher energy intake: they indeed did in absolute terms, though it didn’t reach statistical significance and didn’t result in significantly more fat gain. 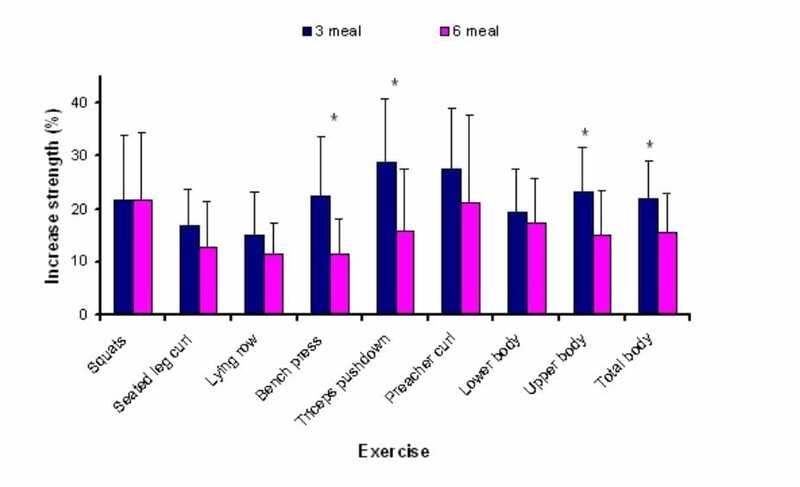 Even if there was a slight imbalance in energy intake though, this may mean it’s not better for muscle growth to eat 3 meals a day, but this study is still strong evidence against the idea that you need to eat 4 or more meals a day for maximum growth. If you eat 3 meals a day and pay careful attention to the distribution of your daily protein intake and food quality, you can probably stimulate maximum muscle growth. What matters mostly is that your body has elevated levels of amino acids in the blood when it needs them for muscle growth, not how many meals you consume per se. If you do not pay attention to your protein distribution or food quality, then consuming 4+ meals a day is the safer course of action. 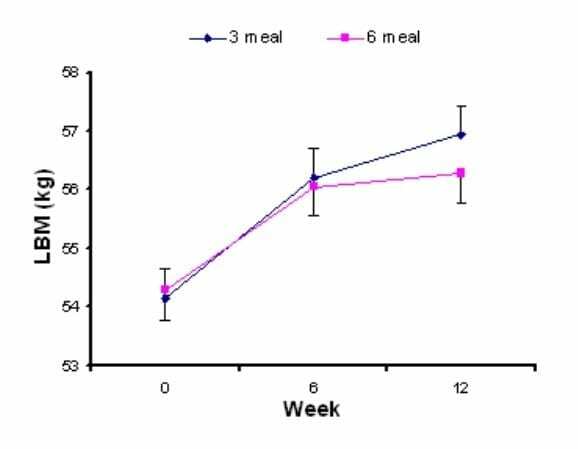 Any benefits of going from 3 or even 2 meals to 4 meals a day will likely be small compared to the effects of total macronutrient intake, however, so for adherence reasons, consuming fewer, bigger meals be worth it for some people regardless.